You may have seen this well known image of Cleveland Jewish life in the early 1900s in "Merging Traditions", 2004 edition, a book students of Cleveland Jewish history should own. It shows most of the nearly 200 members of Local 1750 United Brotherhood of Carpenters and Joiners assembled on the steps in front of Congregation Oheb Zedek at Scovill Avenue and East 38th Street. They were Jewish carpenters, and their banner displayed a Magen David symbol. It is Monday, September 4, 1911. 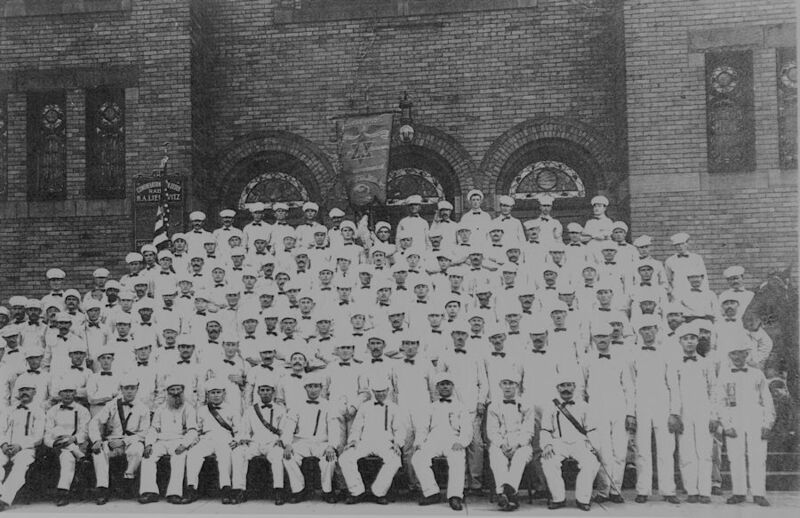 Wearing their white uniforms they would soon join with more than 10,000 other working men and women in the Labor Day parade. The headline in the Plain Dealer was "Marching Unions To Show Strength Labor Leaders Promise Biggest Parade in City's History on Monday". The reviewing stand would be at City Hall. A picnic at Luna Park would follow. Four months earlier Local 1750 had been in the much smaller May Day parade, where the Plain Dealer headline was "Red Flags Fly As Socialists March Lead Procession of Cleveland Party in Celebration of May". These were times of unrest when workers were acting through their labor unions to achieve a larger share of the nation's growing prosperity. Oheb Zedek (lovers of righteousness) was founded by members wanting to remain Orthodox who left when B'nai Jeshurun decided to become Conservative. Built in 1905, the building is now the home of the Triedstone Baptist Church. Why did Jewish carpenters have their own local? It may have been only partly to get more work, assuming that other locals might not give Jews a fair share of work assignments, or in the hope that Jewish builders would contact their local. These were times when ethnicity was a major social dimension. Many of these men, possibly nearly all of them, would have been first generation Americans whose primary language was Yiddish. Having their own local let them conduct business in their native tongue and also to create community. There were locals for other ethnicities, such as Czech and German. Is Local 1750 still active? Searches of the Plain Dealer archive show it was active in 1981 when its president Alfred Antenucci, then 68, was at the scene of John Hinckley's attempted assassination of President Ronald Reagan. He struck Hinckley and took him to the ground. Nearly all articles after 1981 are about Mr. Antenucci or are death notices of Local 1750 members, some of whom had become home builders. The regional union council website does not list Local 1750. Searches using the Cleveland Jewish News Digital Archive tell us more. We learn that in 1935 there was a Carpenters Hall on Kinsman and East 135th St. We see Local 1750 ads in each High Holy Days issue, and again on Passover, the most widely observed Jewish holiday, when secular Jews join in celebrating freedom from slavery and the founding of a people. Local 1750's address is first 3946 Lee Road, then in 1969 becomes 2176 Lee. In 1977 it is 3615 Chester Avenue, suggesting it has been combined with other locals. We show the last ad, which ran in September 1988. The last CJN obituary to mention the deceased as having been a member of the carpenters union appeared in 2006. Learn how you can search the CJN Digital Archive. 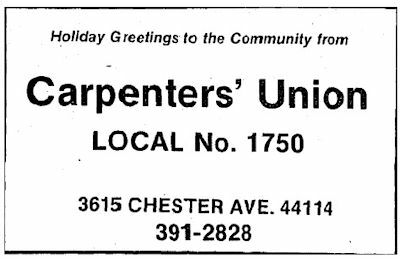 Thanks to Jeffrey Morris we know that the Jewish Carpenters Union had been at 2226 East 55th Street before it bought the Kinsman Road property in 1925. Names on the transfer and mortgage documents he sent me include Meiyr Barbash, Moritz Berko, Max Goldman, Anne Gottlieb, Jacob Marks and Morris Zind. In its day East 55th Street had a concentration of Jewish institutions, like East 105th Street had 20 years later. The carpenters building was near Tifereth Israel, B'nai Jeshurun, the Yiddishe Velt and more. Most who left that area moved northeast to Glenville, but union members tended to head southeast to Kinsman - Mount Pleasant. 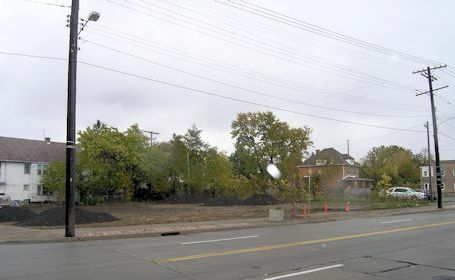 Carpenters Hall still stands at 13503 Kinsman Avenue in Cleveland, at the northeast corner of East 135th Street and Kinsman. The entrance to the auditorium was on the East 136th side of the building. On the south side of the street is the former Council Educational Alliance building, a stop on some of Nate Arnold's tours. 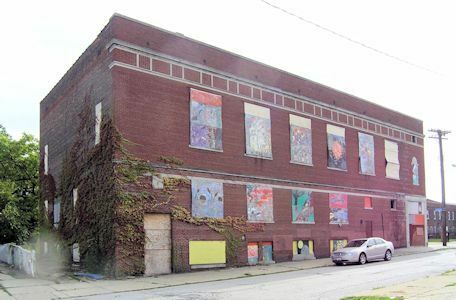 For decades these buildings and the Kinsman Jewish Center were places for Jews to gather in the neighborhood, which in the 1930s was a largely working class area, about 20 percent Jewish. The first Plain Dealer mention of this address is for a political meeting in 1928 at Carpenters Hall. In 1960 stories call it the Allied Industrial Workers Hall. The last listed owner of the building, which has been vacant for years, was a bible college. On the front door of the boarded up building is a Cuyahoga County Land Bank notice of asbestos abatement dated September 23, 2014, days before these photos were taken. 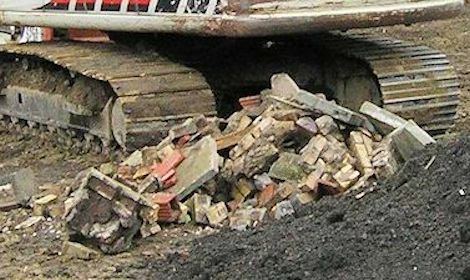 Asbestos removal is required before a building is demolished. On Friday afternoon October 17, 2014 I sent an email to a staff member at the Maltz Museum. 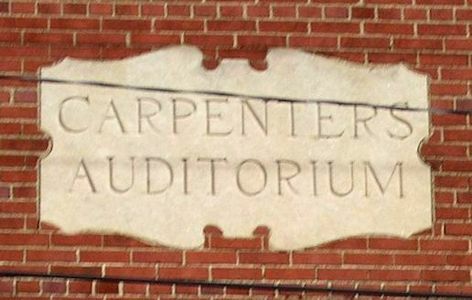 It included the image of the Carpenters Auditorium stone and said "Before that building comes down, and it may be soon, wouldn�t it be good to get this stone for the museum. Might bring back memories just as the Chibas Jerusalem window does for Glenville folks." The next morning I returned with my camera to Kinsman Avenue between East 135th and 136th to take a picture of the main entrance. Where the building had stood just two weeks before was a vacant lot. The Carpenters Union Building has been demolished. All that remains is a small pile of rubble - and the memories of thousands of Jews, Italians and others.